There is a region of the electromagnetic spectrum lying between microwaves and infrared known as the “terahertz gap” that encompasses the frequency range of 0.1 to 10×1012 Hz and corresponds to wavelengths of 3 mm to 30 microns. In the past two decades terahertz imaging has grown in scope across a broad range of applications, including non-destructive testing, security, material characterization, the pharmaceutical industry and medical imaging. In this last example, terahertz imaging has some key benefits: limited scatter in biological tissue; submillimetre spatial resolution; non-ionizing and therefore safe; high signal-to-noise ratio; and amenable to spectroscopic analysis. 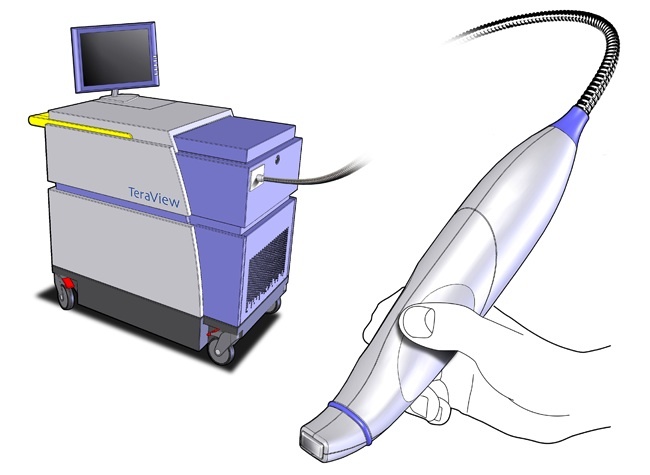 There is a company called TeraView that has been working with clinicians at Addenbrooke’s Hospital in Cambridge and Guy’s Hospital in London, to introduce a hand-held probe for the ex vivo and in vivo analysis of biological tissue, in particular breast tumours. In a study published in Radiology, the researchers examined 22 tissue specimens that had been surgically excised from women with biopsy-proven breast carcinoma. Measured parameters included absorption coefficient and refractive index for three tissue types: tumour, and normal fibrous and fatty tissues. They compared standard micrograph images with terahertz pulsed imaging (TPI) and demonstrated good correlation (see above right). While this ex vivo application illustrated the potential of the technology, a more promising opportunity lies with in vivo imaging, specifically the use of TPI as an intra-operative tool during breast cancer surgery (see left). One of the challenges facing a breast surgeon is to ensure that the entire tumour is excised and that there is a sufficient margin of healthy tissue surrounding the lesion. However, it can often be quite difficult to distinguish between the healthy and cancerous tissues with the naked eye. That’s where TeraView’s terahertz pulsed spectrometer – the TPS Spectra 300 – comes into its own because it operates in real time to confirm the removal of all the cancerous tissue. 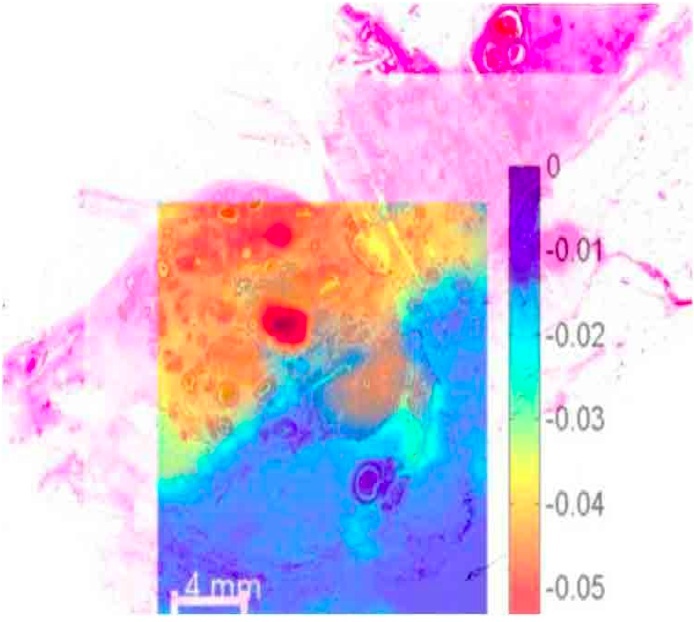 Recently, the successful in vivo detection of early breast cancer using terahertz transmission imaging has been demonstrated in a mouse where the cancer cells plus fatty tissues were injected subcutaneously. The mouse was imaged every 3 to 4 days and cancer volumes as small as 0.02 mm3 were detected. This begs the question: Will terahertz imaging replace the traditional modalities such as mammography and ultrasound? The answer is “probably not” because terahertz waves can penetrate no more than a few millimetres, which is insufficient to detect breast tumours located at a depth of 30 to 40 mm.